The demand for custom CNC parts is at an all-time high. Manufactures of custom CNC fabricated parts are filling their production schedules to meet the demand of the market. While this is a positive trend for the economy, it does create problems for companies looking for a manufacturer for smaller to medium sized product runs. Most manufacturers of custom CNC fabricated parts place top priority on large scale runs, meaning cracking the production cycle for small-medium sized runs becomes extremely expensive and often results in extended lead times. That is where we can help! At TMI, we have much of the technology, equipment, and experience as the large CNC manufacturing companies, but with a focus on small-medium size production runs. Because we aren’t cracking into large production runs, we can be flexible with our production schedule and cost efficient even on short runs. Capitalizing on these gains, without sacrificing quality, is the recipe for a successful product and business. 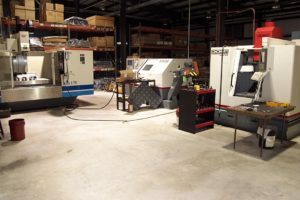 Some of our capabilities include milling, turning, grinding, drilling, tapping, CNC Machining, along with other machining services. Whatever the industry, or application, we can help you take your product from idea to market-ready with precision and ease! If you need more information on our machine shop, feel free to contact us!